Looking for an exciting theatrical experience to take the kids to this summer? We think we've found a perfect solution. From 4 July 2010, the old Eurostar Terminal at Waterloo Station is being transformed into an exciting new theatre space. Above one of the tracks, a huge tunnel-like canopy will keep most of the noise of the station out, and provide the backdrop for an exciting, site-specific children's theatre show: The Railway Children . The star of the show is Stirling Single, a real steam locomotive, which'll appear from a tunnel at a dramatic moment, pulling a carriage, its pistons gleaming, atmospheric steam adding to the theatrical tension. Any young (or old!) fans of Thomas the Tank Engine, E Nesbit's original book, or trains in general are sure to be enchanted by this show. I can't help thinking how many grandparents are going to want to take their grandkids along to see "proper" trains puffing smoke! Other sections of the old Eurostar station are being transformed for the show too. So while you're waiting for the play to start, you can browse an exhibition all about the novel, the history of the railways, The Railway Children Charity, and the setting of the play: Yorkshire. 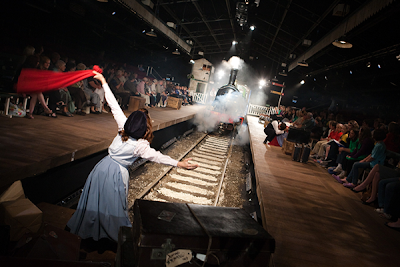 There'll be workshops and interactive exhibitions perfect for involving little locomotive lovers before the show. One of the partners is London's Science Museum, so you know the exhibition will be of a very high standard! It sounds like it's going to be one of the family theatre events of the summer. The Railway Children opens at the Waterloo Station Theatre on 4 July. Running time is 2 hours 20 minutes, including a 20-minute interval. Love Thomas the Tank Engine? The Thomas the Tank Engine website has some fun games, quizzes, online colouring-in tools for your kids, and downloadable Thomas the Tank Engine activity sheets. 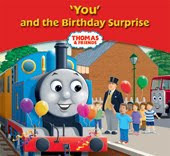 To celebrate their 65th anniversary this year, Egmont children's publishers also have some gorgeous personalised books for only £7.99 - the personalised Birthday Surprise book would make a perfect birthday present. Write a review of a any child friendly gem or family day out on ReallyKidFriendly.com and you'll get 20% off anything you buy at Egmont online children's book store from now until 31 Dec 2010. Too busy to write? Just register on Really Kid Friendly or like our Facebook Fan page and you automatically qualify for 10% off (just ask us for the code).